Now would be a great time to get this for Christmas! 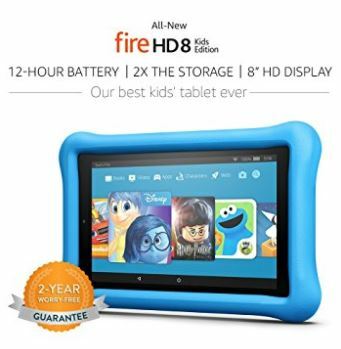 The All-New Fire HD 8 Kids Edition Tablet, 8″ HD Display, 32 GB, Blue Kid-Proof Case (choose from Blue, Yellow or Pink), is only $89.99! That’s $40 off the regular price and the LOWEST it’s ever been! It comes with the case and 2 year replacement guarantee AND it ships for FREE! Got two kids? You can save even MORE when you purchase TWO! 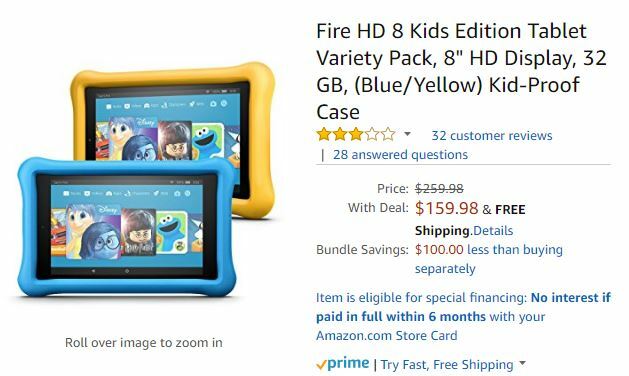 The Fire HD 8 Kids Edition Tablet Variety Pack can be selected in a blue/pink combo, blue/yellow or pink/yellow. Not a toy, a full-featured Fire HD 8 tablet with a vibrant HD display, 32 GB internal storage, and up to 12 hours of mixed-use battery life. Add a microSD card for up to 256 GB of expandable storage. Did you read that third bullet point? Let me expand on it a little. If they break it, Amazon will replace it. No questions asked. We all know accidents happen. The 2-year worry-free guarantee includes coverage for anything that happens to your Fire tablet. Just return the tablet and Amazon will replace it for free. It also covers your Fire tablet against electrical and mechanical breakdowns. TWO YEARS of “whatever happens, it’s covered” insurance!